The right instinct is essential when brewing. But just as important are the control and precision in every single step of the brewing process," agree Gebhard Sauseng and Daniel Gore. The two SUDHAUS brewers are not only long-time employees of Anton Paar, but also have beer in their blood. Daniel is a trained brewer and maltman with many years of experience in Germany and the USA and with Anton Paar as key account manager for the European beverage industry. Gebhard is a qualified beer sommelier and has many years of experience as a hobby brewer. In Anton Paar's SUDHAUS in Graz (Austria), the two brewmasters have been producing delicious beer in the attractive, in-house brewery since January this year. Currently, three varieties are available that are fermented in four 600-liter tanks and may mature in eight storage tanks. More varieties will follow, like a smooth lager beer or as well as a strong Bock beer and one or the other specialty. For perfect beer, of course, you not only need intuition and good raw materials, but also the right analytics. The SUDHAUS brewery has everything Anton Paar offers to facilitate a brewmaster’s life. During mashing and refining, enzymes convert the starch of the malt into fermentable sugar. "We use Austrian organic malt," explains Gebhard Sauseng. In the lautering process, extract is measured with the inline sensor L-Dens 7400 and in the laboratory with DMATM 35 V4, PBA-B, DMATM 4500 M, or the new DMATM 1001. The same systems are used in the analysis of the processes in the wort kettle, where hops give the beer bitterness and aroma. Here, the main focus is put on extracts and original wort. 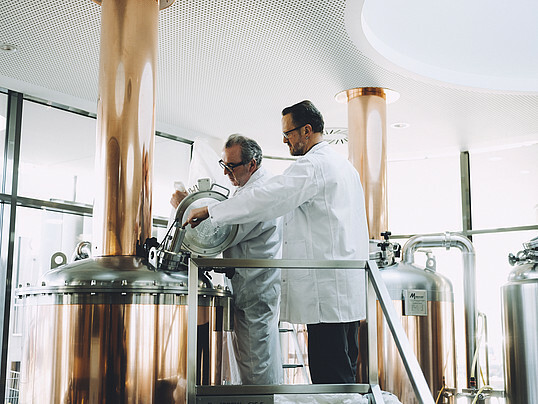 "Most of the measurement parameters are required for fermentation, where selected yeast strains convert the malt sugar into alcohol and where data on alcohol content, extract, color, turbidity, and carbon dioxide are required," says Daniel Gore. Two L-Rix 510 sensors monitor the fermentation process and send the measured data to two mPDS 5 process evaluation units. An Alex 500 for alcohol, density and extract, a Lovis 2000 ME for viscosity and a CboxQC for carbon dioxide and oxygen are also available on the laboratory bench. And even an EasyDens can be found there. The table is a highlight of the brewery, oval curved, illuminated, with a height-adjustable monitor as the central element for controlling the brewing plant. Once the fermentation is complete, the young beer gets an analytical break for the first time and may rest and mature for some time, depending on the production process. "Our top-fermented beer remains in the storage tank for about three weeks," says specialist Gore. For control purposes, the entire equipment on the laboratory bench is used to measure carbon dioxide, color, turbidity, and above all alcohol and original extract. These values are used to calculate the tax, so a perfect analysis provides security. One thing, of course, cannot be replaced by analytics - the brewer's testing sip. "This is the only way to discover tastes that are broken down when maturing," say the brewmasters. These days, three types of SUDHAUS beer are available: a refreshing light cellar beer (“Das Erste”), a full-bodied dark beer (“Das Altsteirische”) and a light wheat beer (“Das Weiße”). Soon a bottom-fermented lager (“Grazer Lager”) and a Bock style beer for cold winter days will follow. And perhaps one or two rarities, smiles Gebhard Sauseng.